The first LWS/SDO first science workshop will be held May 1-5, 2011 at the Resort at Squaw Creek, near Lake Tahoe, CA (http://www.squawcreek.com/). The meeting theme will address science questions that are fundamental to all three of SDO's science investigations (AIA, EVE & HMI). All members of the science community are welcome and encouraged to attend. Additional information, including registration and housing, can be found at http://lws-sdo-workshops.org. Based on discussions with the science teams, it was decided to use the new offset procedure for future Lunar Transit operations to minimize instrument off-pointing during the transitions from Science to Inertial mode and back. Obtained agreement from the HPA vendor to replace all DC fans with AC fans to improve reliability. The repairs will be done on a rotating cycle to continue operations while units are being repaired. The second HGA handover season ended on November 1. Operations went smoothly throughout this handover season and another Lunar Transit on 11/6. The data capture completeness for October was 99.94% for all three Instruments. Only rain on DOY 278, a spacecraft station-keeping maneuver on DOY 279, and the HMI Roll calibration on DOY 285 kept us from 100%. The Inertial/Science mode pointing test was run on Wednesday, 11/10 between 1800 to 1830 UTC. This tested the STOL procedure that redefines the target attitude to minimize the attitude shift between Science and Inertial modes is minimized. This will benefit future Lunar Transit operations. 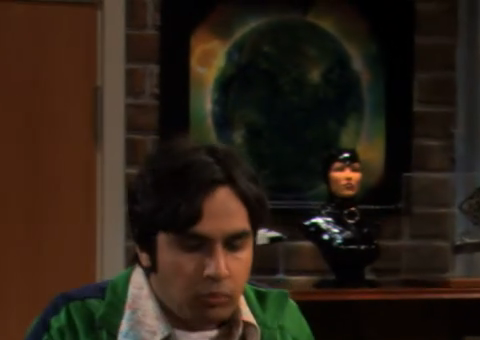 The "Sun as an Andy Warhol Poster," made from an AIA image, can be seen in the background of an episode of The Big Bang Theory on CBS, with a short clip on Youtube. Here comes the Moon! Right on schedule the Moon passes between SDO and the Sun, seen here in the AIA 171 bandpass. We use these transits to understand the pointing of the spacecraft. One of these transits will someday block out an active region so that we can study the energy in that region with EVE. Today's transit covered part of the southern hemisphere, which is pretty quiet, and blocked the quietest part of that. Next lunar transit is December 6 at 0310 UTC. 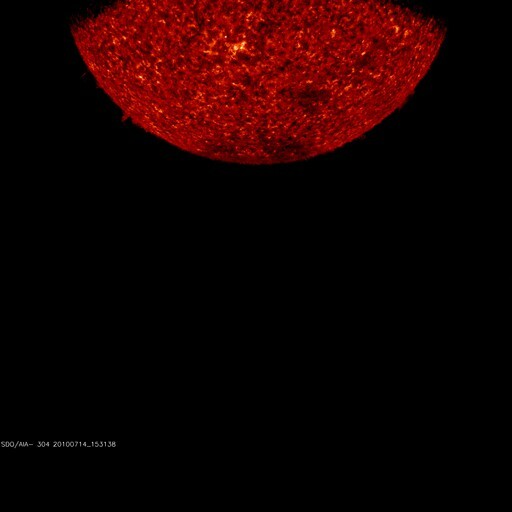 Images are flowing from the JSOC to the SDO website again. 2010-11-05: The JSOC data pipeline is temporarily down. It will be back up later today. An AIA FIrst Light image appeared last nite on the CBS show The Big Bang Theory. You can watch the clip at CBS.com. Here is a screen shot to orient you to the bookcase behind the door. Thanks to Sara and Sarah for taking the pictures and other goodies to the show! The EVE cruciform was delayed for one day and performed on Thursday. 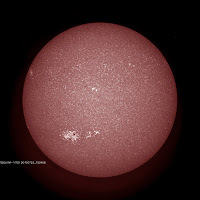 Some of the images in Thursday's movies were taken when SDO was pointed away from the Sun so they are missing or have the stripes we saw last week. The Instrument calibration activities were shifted this week to accommodate the 40-hour continuous observation campaign of the Hinode satellite observation. This was to study the emergence and disappearance of magnetic flux at the Sun’s disk center. EVE reported that there was some improvement in the MEGS-B performance after the previous CCD bakeout but they will return to a 24 hour bakeout during the next eclipse period. The FOT updated the jitter wheel speed limits to 850 rpm from the 380 rpm limit set prior to launch. Today, data will be sporadic as a result of the EVE cruciform calibration maneuver. The satellite will swing back & forth and up & down for 8 hours. There will be a scheduled electrical outage in building 21 at Goddard Space Flight Center. Our web server will be shutdown from October 29, 2010 at 6 pm to October 30, 2010 at 4 pm. Check out the latest 48 hour movies to see some spectacular prominence eruptions on both sides of the Sun! AIA 304 48 hour movie. Kepler "asteroseismology" and SDO HMI "helioseismology"
SDO is performing several instrument calibration maneuvers today. During these maneuvers the AIA boresight is being moved away from the center of the Sun. When the images are re-centered some of them have lines to the edges of the picture (such as we see in this 211 image). It appears that the re-centering of the images is copying the value at the edge of the field of view rather than zero while the image is being shifted to the center of the picture. This will affect the rapid images shown on the SDO website and the LMSAL Sun Today website but will be corrected in the science database. 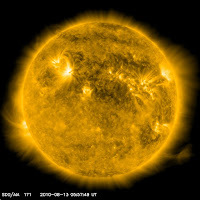 However, information that is missing from images because the instrument is not pointed at the Sun cannot be recovered. With a large active region currently in the northern hemisphere of the Sun, there has been a flurry of small solar flares over the past day. This larger active region may actually be comprised of four different active regions that are very close to each other forming one large, interconnected active region with multiple magnetic poles. This magnetically complex region has lead to 12 B-class and 1 C-class solar flare over the last 24 hours. Make sure to check out the daily and past 48-hour movies to see this rapidly evolving active region! There will be a scheduled electrical outage in building 21 at Goddard Space Flight Center. Our web server will be shutdown on October 21, 2010 at 4pm through October 22, 2010 at 11am. The First LWS/SDO Workshop: "The Sun's Magnetic Activity Spectrum"
The dates have been set for the first SDO science workshop: May 2 - 6, 2011. The meeting will be held near Lake Tahoe, and the conference will highlight the science of all three SDO instruments: AIA, EVE and HMI. We encourage interested members of the science community to attend. 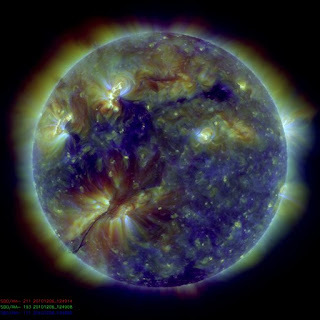 On October 12 SDO successfully performed a 7-hour roll maneuver to help calibrate the HMI instrument calibration. The spacecraft roll started at same time as HGA handover operation. This complicated the operational sequences but did not stop either maneuver. 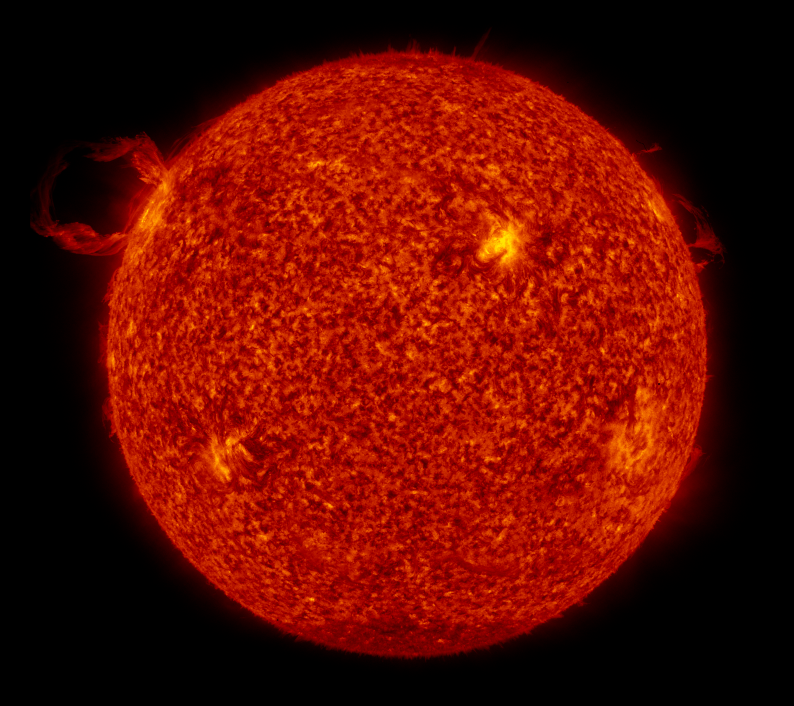 While it is easy to point a space-based instrument at the center of the Sun it is more difficult to know the precise location of the Sun's rotation axis. Data from the roll maneuvers help the scientists to understand how their instrument response varies at different angles of the rotation axis. This is then used to more accurately remove the rotation effects from the data. A Southern Active Region, but No Southern Polar Coronal Hole? As active region 11112 rotates into view we are seeing Solar Cycle 24 continue to increase in activity in both hemispheres. 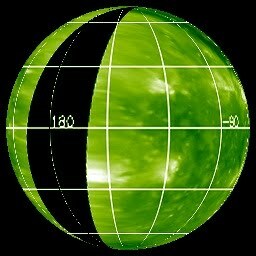 But why is there a dark hole in the Sun's north pole when we look at AIA 193 images but not in the south? These dark patches are called Polar Coronal Holes and are places where the Sun's magnetic field emerges from the Sun into the heliosphere. They are best seen at solar minimum and disappear at solar maximum. But there may be a hole in the south that we can't see. The Sun rotates on an axis that is tilted from the Earth's orbit by about 7 degrees. From August to October people watching the Sun from the Earth see the Sun's north pole and the Sun's south pole is invisible. From February to April we can see the south pole but not the north. 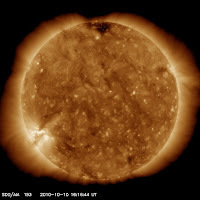 To see if there is a southern polar coronal hole you need to look at the Sun from another position. We happen to have two STEREO spacecraft almost 90 degrees from the Earth doing just that. If you go to the STEREO webpage you will see there is still a southern polar coronal hole! We now have movie links that you can embed in your webpage. 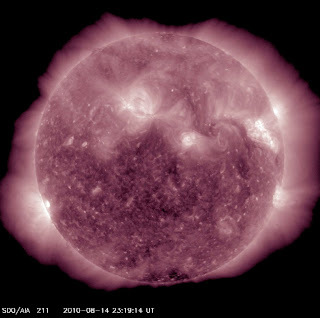 They will show the Sun for the previous 48 hours in a chosen wavelength. Every 30 minutes the movie refreshes to the latest 48 hours. A link builder to construct the object is in the data menu item. An example html file that shows 5 AIA wavelengths and the HMI magnetogram can be downloaded here. We have released rss feeds for our data. Each feed consists of data from the last 48 hours. We have finished reprocessing images for some days in July, August, and September. 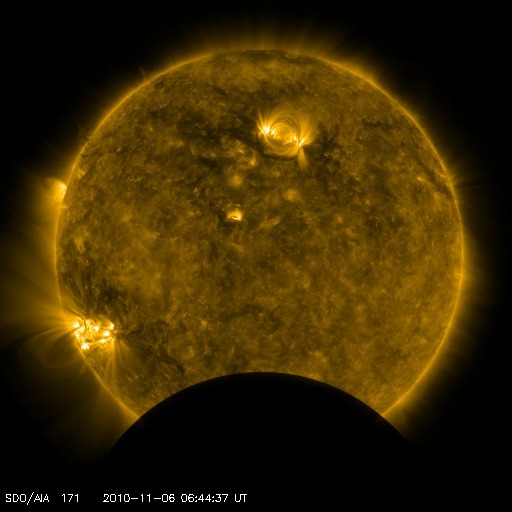 SDO enters another eclipse season at 0700 UTC on September 15, 2010. The last day is October 7, 2010. The longest eclipse during this season is 67.4 minutes on September 26. Eclipses happen near the solstices when the Sun, Earth, and SDO orbit come into alignment. They are a normal part of life with a geosynchronous observatory. Because SDO is in an inclined orbit the eclipse season is not centered on the solstice. Solar data will not be available during an eclipse but will be available during the rest of the day. Next up is a lunar transit on October 7. Here is an animation of what the lunar transit will look like. 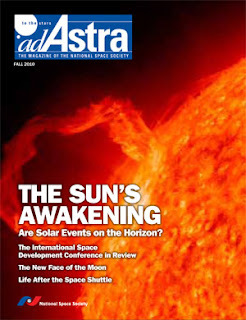 An article on SDO and the end of the "sluggish" solar minimum is the cover story for the Fall 2009 issue of Ad Astra magazine. Yet another magazine finds SDO too beautiful to resist! AIA images are once again flowing to the website. Please check out the eruption in the upper right of the 304 channel at 2341 UT on September 8, 2010. At this time we are not receiving images from AIA. The data is flowing from SDO to the JSOC, but the ground software is not creating the AIA images we display on the SDO website. Some bandpasses and the HMI images are being updated, but most are not. The problem is being worked and should be fixed soon. On Monday around 0500 UTC, SDO pointed toward Regulus, a bright star in Leo. Half of the solar disk was kept on the CCDs and Regulus was to be a rotation indicator, helping us learn the roll angle of SDO around the Sun. Analysis of the data is continuing. Today at 1920 UTC SDO used its thrusters to dump momentum from its reaction wheels. These wheels keep SDO pointed at the Sun as it orbits the Earth and the high-gain antennas keep turning. All that turning is transfered to the reaction wheels; every so often we have to reduce the wheel spin rates. We used 20 grams of propellant in the maneuver. The latest 48 hour mpegs have been released on the website. They are available for all 10 AIA channels. At this time we are not receiving images from AIA and HMI. The data is flowing from SDO to the JSOC, but the ground software is not creating the images we display on the SDO website. Some bandpasses are being updated, but most are not. NOTICE: This website will be down between the evening of Thursday, August 19, 2010, and the afternoon of Friday, August 20, 2010, for scheduled maintenance of the power and cooling systems. 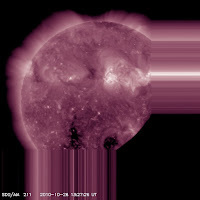 Yesterday morning at around 9:00 UT the Sun erupted with another beautiful coronal mass ejection. The image is from AIA at a wavelength of 211 Angstroms, click the image to see the eruption. Active regions 1093 and 1099 erupted with a C-class flare and CME this morning at about 1000 UT. Here is a movie produced at LMSAL AIA showing the 193 bandpass of AIA. It looks pretty good in the various bandpasses in the Browse Data movies on this website. 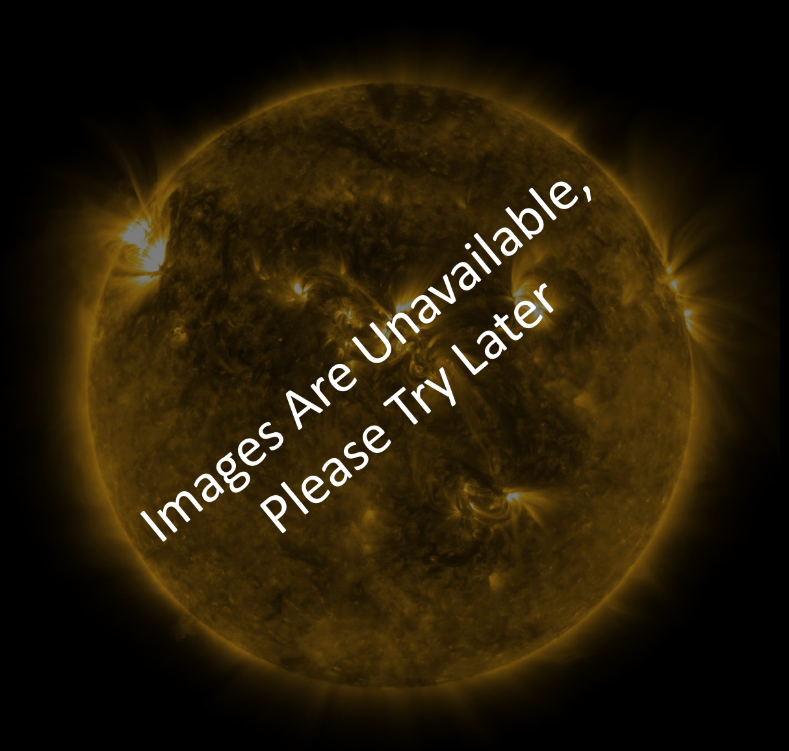 The SDO team works hard to keep the images and data flowing to this and other websites. Software is needed to move and analyze the images; sometimes that software breaks. Hardware is needed to host and serve the images; sometimes we lose power to a computer. We have experienced several outages the last two weeks during which the images were not available. After the outages were fixed, software was written to reconstruct the images missing from this website from the JSOC in California. We are also working to make the system more robust. My thanks to the people who keep the data flowing. Today we have all the images flowing correctly and the movies working. Check out a day's worth of Dopplergrams. Or what happened at about 0600 UTC this morning. These images in 171 (left) and 304 (right) show a very nice filament eruption in the lower right limb of the Sun. The 304 bandpass is cooler material and we often see eruptions in that channel. The 171 bandpass is hotter material (about 1 million K) and is less common in the erupting material. You can see the plasma in motion by looking at the daily movies for August 13 or through our Browse Data page. AIA images are once again flowing to the site. 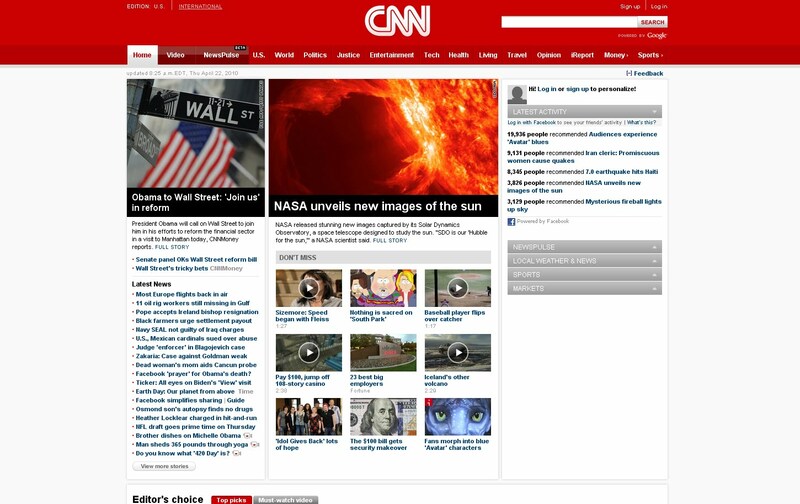 We are now including the HMI Dopplergrams and intensitygrams in the Sun Now section. Intensitygrams are images of the Sun in the red part of the visible spectrum. They are similar to the MDI continuum images that the Stanford group has posted during the SOHO mission, but with higher spatial resolution so you can better see the details of active regions and faculae. Right now these images are in B&W and do not have the limb darkening removed. Dopplergrams, like the one on the left, are the raw data of helioseismology, using waves at the surface of the Sun to look inside the Sun. The Dopplergrams are also shown in B&W. Parts of the Sun moving toward you are darker and those moving away are lighter in color. The rotation velocity of the Sun has not been removed and you can see that the left side of the images moves toward SDO and the right side away. That means the Sun is rotating! The pattern seen across the surface shows a convection cell called supergranulation. The Dopplergrams need to be viewed in a movie to show the p-modes. Movies of the images will be available in a few days when enough images have been collected. You can also visit the HMI website at http://jsoc.stanford.edu/data/hmi/images/latest/ to see these images. The AIA and HMI images are again flowing to the Data part of the SDO website. We are sorry for any inconvenience. At this time we are not receiving images from AIA and HMI. The data is flowing from SDO to the JSOC, but the ground software is not creating the images we display on the SDO website. 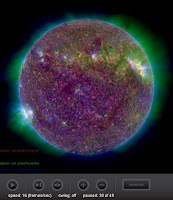 Solar Cycle 24 in the Southern Hemisphere? Solar Cycle 24 is starting to come alive and show active regions, sunspots, flares, and CMEs. On Sunday AR 11093, the large magnetic complex in the center of this AIA 171 image from August 10, 2010, had an M-class flare. Two Earth-directed CMEs have been launched in the last 10 days. The only thing that is missing is activity in the southern hemisphere. It is normal for the two hemispheres of the Sun to reach maximum at different times, but there seems to be an increasing lag, with the southern hemisphere reaching maximum later than the northern. Stay tuned! The coronal mass ejection from August 1 hit the Earth at 1740 UT on August 3. It caused a moderate geomagnetic storm resulting in beautiful auroral displays. 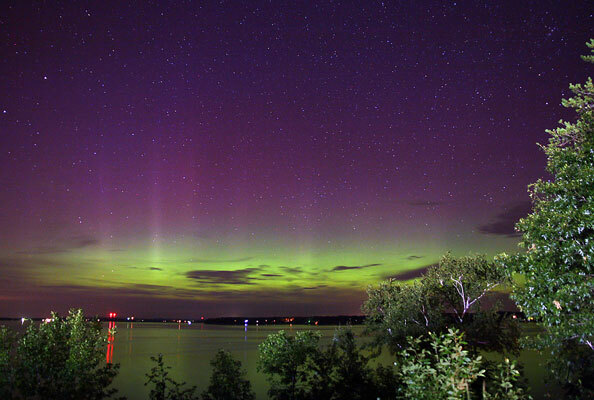 This photo was taken by Tony Wilder of Chippewa Falls, WI. A second eruption may hit Earth in the next two days, perhaps causing more geomagnetic activity. 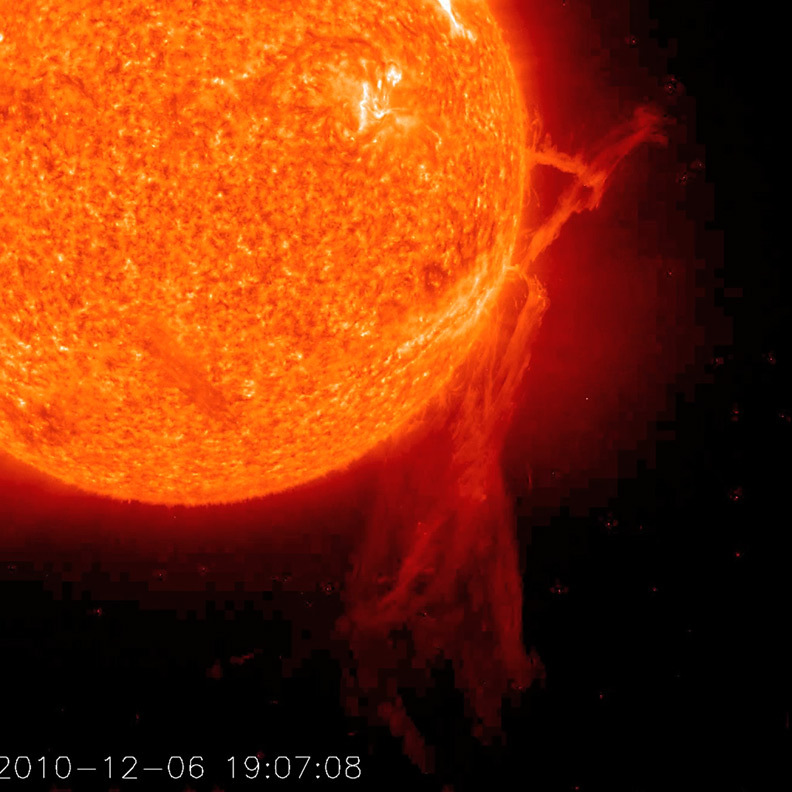 Coronal Mass Ejection Headed for Earth? On August 1st around 0855 UT, the Sun let loose a C3-class solar flare. The origin of the blast was Earth-facing sunspot 1092. C-class solar flares are small (when compared to X- and M-class flares) and usually have few noticeable consequences here on Earth. This flare, however, was accompanied by a very fast coronal mass ejection that appears to be heading in Earth's direction. 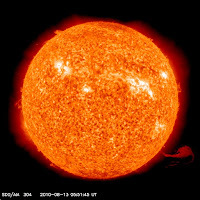 Coronal mass ejections (or CMEs) are large clouds of charged particles that are ejected from the Sun over the course of several hours and can carry over ten billion tons (10^16 grams) of plasma. They travel away from the Sun at speeds than can exceed several million miles per hour, and can make the 93-million-mile journey to Earth in as little as a day. 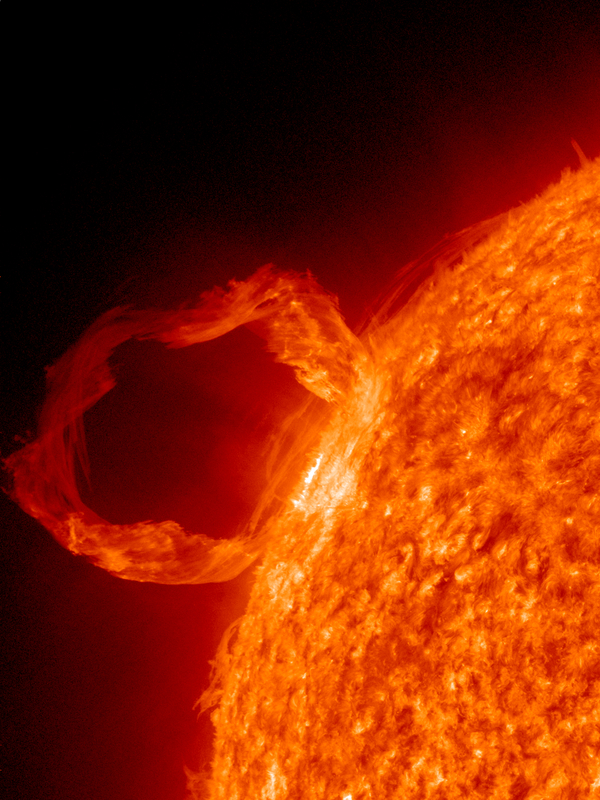 On August 1, 2010 SDO observed a beautiful prominence eruption that may hit Earth and cause a geomagnetic storm. As the solar cycle progresses and the Sun becomes more active there will be many more opportunities to observe the causes of space weather. Want to see what happens? Follow the event at spaceweather.com. Esquerdo was located on adjacent Mt. Hopkins. "Twice a year, the sun sets behind Kitt Peak as seen from the ridge on Mt. Hopkins and the Whipple Observatory," he says. "Our monsoon thunderstorms cooperated long enough for me to photograph the event." Kitt Peak is home to more than a dozen world-class telescopes, and many of their silhouettes can be seen in Esquerdo's photo. Highlights include the triangular profile of the great McMath-Pierce solar telescope and the towering dome of the Mayall 4-meter telescope. Caution: Although sunspot 1089 is large enough to see with the naked eye, looking for it is not recommended. Even when sunlight is dimmed by clouds and haze, you can still suffer permanent eye damage by staring too long at the unfiltered sun. Be careful. UPS Repair work is completed, and normal processing has resumed. Missing products will be available as soon as possible. We have added a new addition to the SDO data browser. 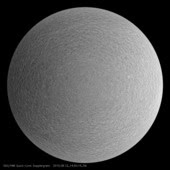 Starting on the 2010-07-16, the four composite images featured on the "Sun Now" page are being time stamped and archived on our site at a 15 minute cadence. These are available for browsing and downloading. 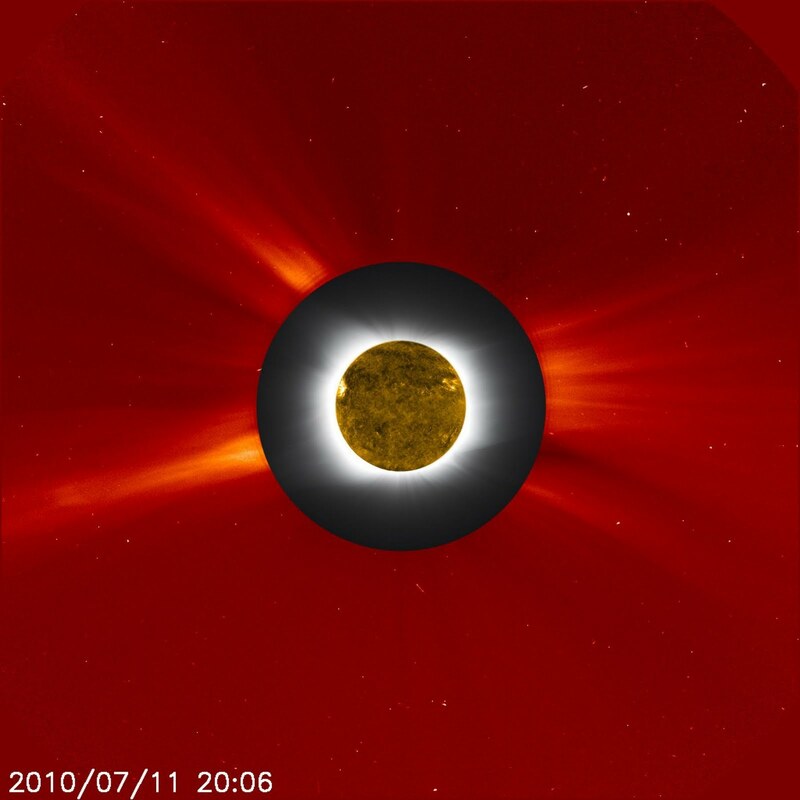 On July 11, 2010, the new moon passed directly in front of the sun, causing a total solar eclipse in the South Pacific. 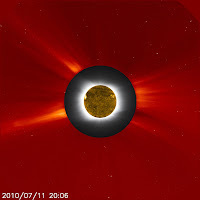 In this image, the solar eclipse is shown in gray and white from a photo provided by the Williams College Expedition to Easter Island and was embedded with an image of the sun's outer corona taken by the Large Angle Spectrometric Coronagraph (LASCO) on the SOHO spacecraft and shown in red false color. LASCO uses a disk to blot out the bright sun and the inner corona so that the faint outer corona can be monitored and studied. Further, the dark silhouette of the moon was covered with an image of the sun taken in extreme ultraviolet light at about the same time by the Atmospheric Imaging Assembly on the Solar Dynamics Observatory. The composite brings out the correlation of structures in the inner and outer corona. 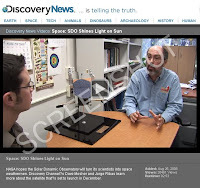 We found and would like to share a pair of back dated videos from Discovery News about SDO. 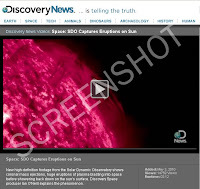 New high-definition footage from the Solar Dynamic Observatory shows coronal mass ejections, huge eruptions of plasma blasting into space before showering back down on the sun's surface. Discovery Space producer Ian O'Neill explains the phenomenon. 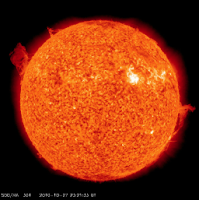 NASA hopes the Solar Dynamic Observatory will turn its scientists into space weathermen. Discovery Channel?s Dave Mosher and Jorge Ribas learn more about the satellite that's set to launch in December. Today and tomorrow there will be many blank images of the Sun as SDO does a series of calibration maneuvers designed to understand how the instruments work. The EVE cruciform maneuver is running today; tomorrow we run a few others for all three instrument. These maneuvers are used to track changes in the instruments as they sit in space. We will return to 24/7 data collection late tomorrow (July 15, 2010). We have added a new composite image to "The Sun Now" page. This composite image consists of the latest AIA 171 and the latest HMI magnetogram images. Sizes include: 4096, 2048, 1024, 512, and 256. 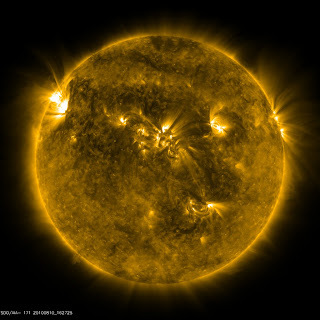 Hot on the heels of the official commissioning of the Solar Dynamics Observatory (SDO), on May 17 at Goddard, the spacecraft has begun its science mission and is sending terabytes of data and stunning images to Earth each day. SDO's images are revealing surprising new insights about how changes on the Sun affect us here on Earth, so it should come as no surprise that public and media interest in the SDO mission has been running at a fever pitch. Most recently, the SDO mission was featured at the 216th meeting of the American Astronomical Society (AAS) and the 2010 Solar Physics Division (SPD) Meeting, held jointly from May 23-27 in Miami, Fla. A number of SDO-related events took place that highlighted the mission’s first science results. Several education and outreach events also took place in conjunction with the meeting. As the arcing loops above an active region began to rotate into a nice profile view, SDO captured the dynamic, magnetic struggles taking place below (July 6-8, 2010). Particles spiraling along magnetic field lines trace their paths. Magnetic forces in the active region are connecting, breaking apart, and reconnecting. These images were taken in extreme ultraviolet light. 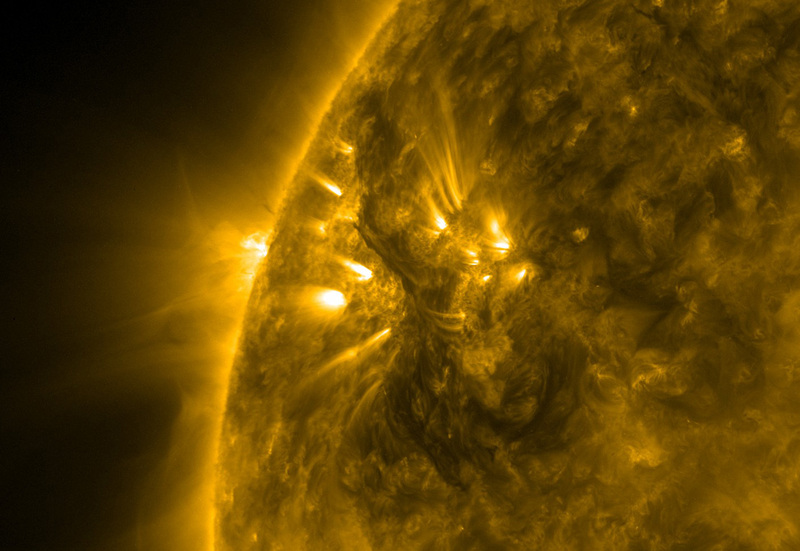 Although mostly hidden from our view, the active region did unleash a number of small flares. Credit: NASA/Goddard/SDO. Now that the AIA and HMI data are flowing through the data system, you can look at images of the Sun and make movies of the Sun. 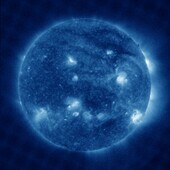 Check out the SDO Browser at http://sdo.gsfc.nasa.gov/data/aiahmi/browse.php! You can look at AIA images after May 20, 2010 and HMI magnetograms created after June 20, 2010. We are working to put the EVE SAM images we show on the Sun Now page into the movie database. 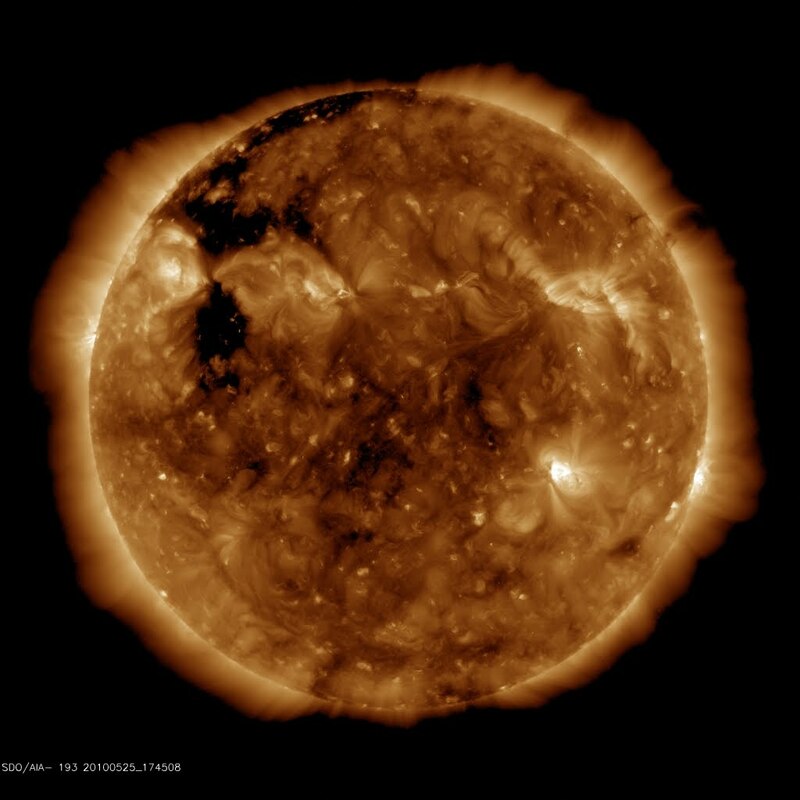 Check out the enormous coronal hole in the northern hemisphere seen last week in AIA 193. 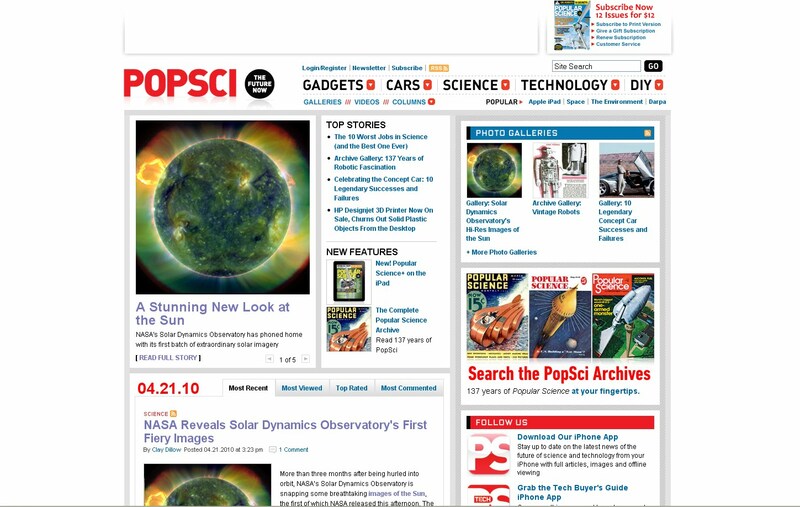 SDO was featured in a video on NPR's Science Friday website (www.ScienceFriday.com). We described the Sun's magnetic field, the rise to Solar Cycle 24, and how SDO will help to understand the magnetic field. David Hathaway of NASA Marshall Space Flight Center was the guest on the show, discussing solar activity. » Read the NPR Article. The Version 1 official calibrated products are now available effective June 18, 2010. We currently support only expert access directly to the files. A graphical tool that supports searching will soon be available. EVE has been making solar measurements since March 26, 2010. Normal operations began on May 1, 2010. The ESP Level 1 irradiance data are fully calibrated and corrected for particle background, visible light leakage, degradation in sensitivity, and spacecraft location (corrected to 1‐AU). A suborbital sounding rocket payload is flown once a year for EVE absolute calibrations. The first suborbital flight after the launch of SDO was on May 3, 2010. Daily on‐orbit calibrations are performed to track changes in detector dark current, filter condition, and electrometer gain. Each data file covers a time span of 24 hours with 4 measurement/sec cadence. Level 1 data is available with 1 day latency. ESP Level 1 readme (PDF) - This readme (PDF) describes the data in the version 1 ESP level 1 products. There are 2 types of EVE level 2 products: Spectra (EVS) and Lines (EVL). Level 2 spectra are the merged spectral measurements from the two spectrographs, A and B. The A detector is designed to measure from 6‐17 nm, and 16‐38 nm using two filters, while the B detector is designed to measure 35‐105 nm. Level 2 processing stitches these pieces to form one spectrum. Lines are integrated from low to high bounds, and the 4 Hz photometer data are averaged down to the same time scale as the spectrum. No continuum is subtracted from the line irradiances. Level 2 readme (PDF) - This PDF file describes the version 1 level 2 products (spectra and lines). We have started a beta version of an SDO movie browser. It allows you to look at movies and still images of the AIA 15-minute cadence data since May 26, 2010. 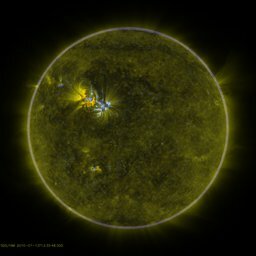 We have released the SDO data browser. It allows you to look at movies and still images of the AIA 15-minute cadence data since May 20, 2010. NASA's Solar Dynamics Observatory, or SDO, has allowed scientists for the first time to comprehensively view the dynamic nature of storms on the sun. Solar storms have been recognized as a cause of technological problems on Earth since the invention of the telegraph in the 19th century. 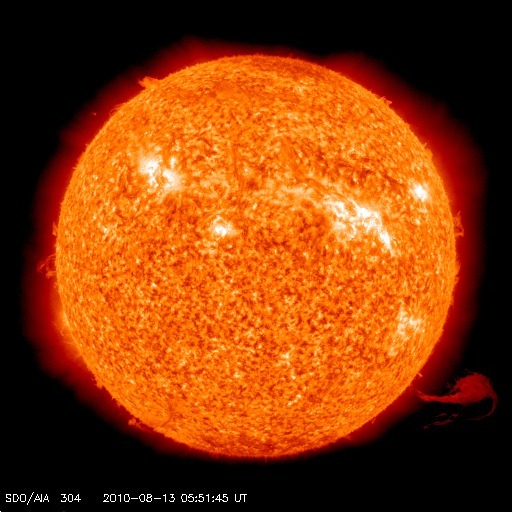 The Atmospheric Imaging Assembly (AIA), one of three instruments aboard SDO, allowed scientists to discover that even minor solar events are never truly small scale. Shortly after AIA opened its doors on March 30, scientists observed a large eruptive prominence on the sun's edge, followed by a filament eruption a third of the way across the star's disk from the eruption. "Even small events restructure large regions of the solar surface," said Alan Title, AIA principal investigator at Lockheed Martin Advanced Technology Center in Palo Alto, Calif. "It's been possible to recognize the size of these regions because of the combination of spatial, temporal and area coverage provided by AIA." Explanation: Suspended by magnetic fields above a solar active region this dark filament stretches over 40 earth-diameters. The ominous structure appears to be frozen in time near the Sun's edge, but solar filaments are unstable and often erupt. 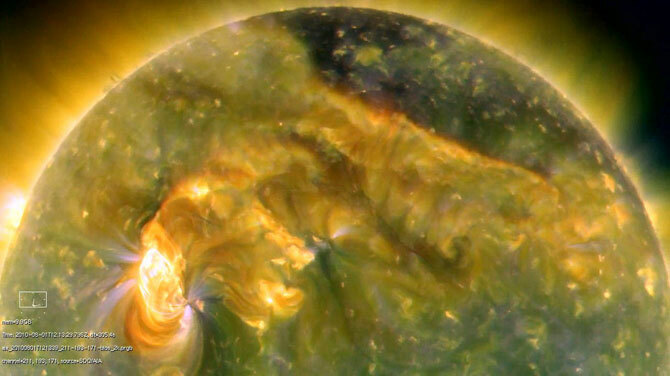 The detailed scene was captured on May 18 in extreme ultraviolet light by cameras on board the Solar Dynamics Observatory. While the cooler plasma of the filament looks dark, hotter, brighter plasma below traces magnetic field lines emerging from the active region. When seen arcing above the edge of the Sun, filaments actually look bright against the dark background of space and are called prominences. KQED, Northern California Public Broadcasting (NCPB), has produced a very good piece on SDO titled, "Journey to the Sun"
Scientists at Stanford University and Lockheed Martin are playing pivotal roles in a nearly billion-dollar NASA mission to explore the sun. A spacecraft launched in early 2010 is obtaining IMAX-like images of the sun every second of the day, generating more data than any NASA mission in history. We have had haikus and sonnets written about the commissioning phase. Now a First Light poem, written by Stuart Atkinson about the prominence eruption on March 30, 2010. Of a phoenix's graceful rise and fall. Check out the launch of the EVE calibration rocket launch at http://lasp.colorado.edu/rocket/rocket_movies.html. It shows the countdown and the rocket flying away. Karel Schrijver of Lockheed Martin's Solar and Astrophysics Lab is leading the analysis. "We can see a billion tons of magnetized plasma blasting into space while debris from the explosion falls back onto the sun surface. These may be our best data yet." SDO EVE calibration rocket launch day! SDO has 10 CCDs, 8 inside the science instruments and 2 in the star trackers. The science CCDs operate at very low temperatures. The EVE CCDs are 2Kx2K pixels and operate at -100 C. The HMI and AIA CCDs are 4Kx4K and operate at about -70 C. HMI has 2 high-grade visible light CCDs while AIA and EVE treated their CCDs to make them more suitable for detecting extreme ultraviolet light. To cool a CCD we hook it to a radiator panel and keep the Sun off the panel. Thermal radiation leaving the panel is enough to send into space the small amount of heat generated by operating the CCD. An example of how the Sun affects our satellite fleet happened on April 5, 2010. Unusually violent solar activity caused the Galaxy 15 satellite to stop responding to ground commands. A backup satellite is being moved into position and it is hoped that Galaxy 15 will be recovered. SDO is moving toward becoming an operational science mission. The data will be available from several sites in a variety of formats. SDO scientists and engineers are working to set up those access points, but we won't be ready for regular data releases until mid-May. Next step is the EVE calibration rocket, scheduled to fly on May 3, 2010 from the White Sands Missile Range. The March 30, 2010 solar prominence seen by SDO is the Astronomy Picture of the Day for 2010 April 23. Thursday marked the end of image quality jitter testing on SDO. For the past few days the observatory has spun reaction wheels, rotated high-gain antennas, and moved filter wheels. All this to see how each mechanism affected the staring at the Sun. All of the data must now be analyzed and our fine pointing refined to allow us to stare at the Sun. This week also saw the isolation of the main engine. We no longer need the large thrust provided by the main engine and the pipes carrying fuel and oxidizer to it have been closed and sealed. Thanks for the lift! The principal investigators of the SDO science investigation teams, Philip Scherrer (HMI), Alan Title (AIA), and Tom Woods (EVE) joined Dean Pesnell and Lika Guharthakurta in an SDO First Light press conference yesterday at the Newseum in Washington, DC. 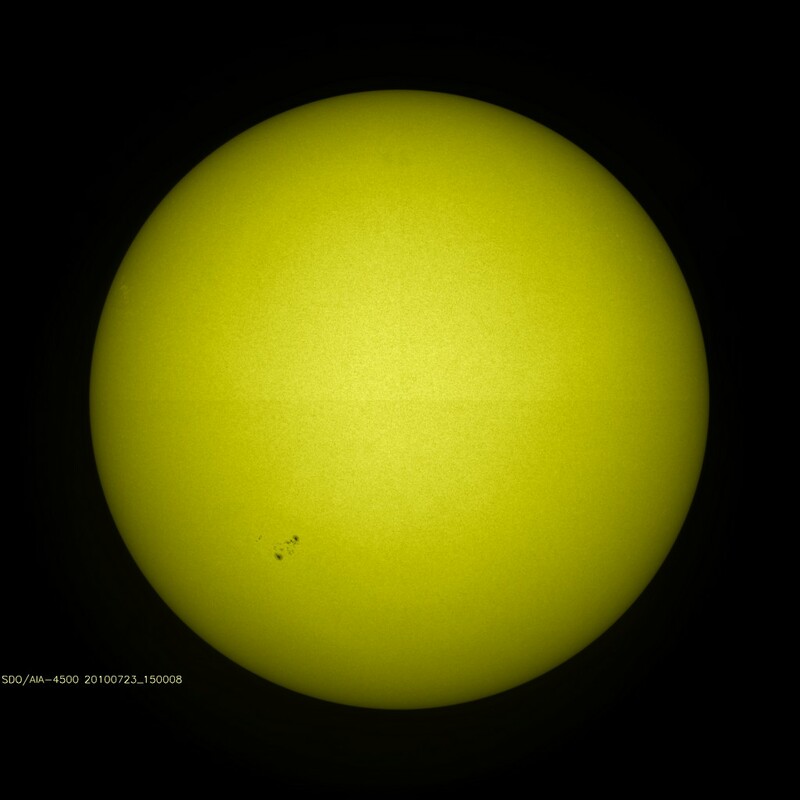 The announcement has garnered a lot of press and many examples of those few solar events that saw fit to appear between March 30 and April 8 are now available. Here is an example from March 30, 2010, just after the AIA CCDs were allowed to cool. Such a lovely prominence eruption at 10 o'clock! Congratulations to the SDO team members around the world for getting us to the beginning of the science mission. 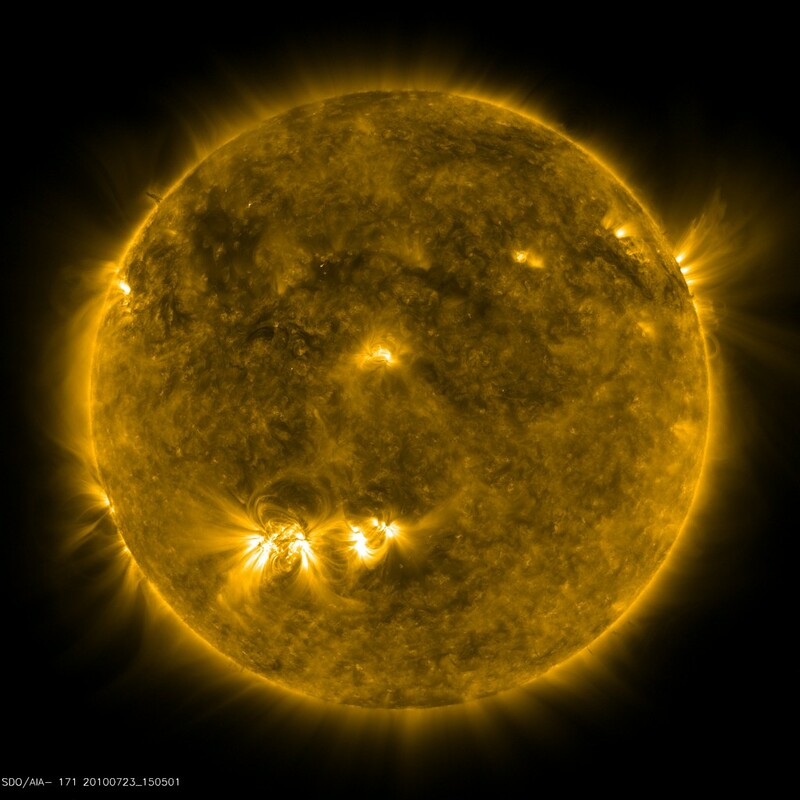 WASHINGTON -- NASA will hold a news briefing and unveil initial images from the Solar Dynamics Observatory, or SDO, at 2:15 p.m. EDT on Wednesday, April 21, in the atrium of the Newseum. The Newseum is located at 555 Pennsylvania Ave., NW, in Washington. NASA Television and the agency's Web site will provide live coverage of the briefing. 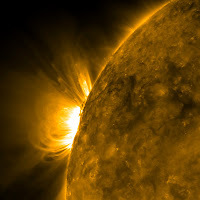 Launched on Feb. 11, 2010, SDO is the most advanced spacecraft ever designed to study the sun and its dynamic behavior. The spacecraft will provide images with clarity ten times better than high definition television and more comprehensive science data faster than any solar observing spacecraft in history. 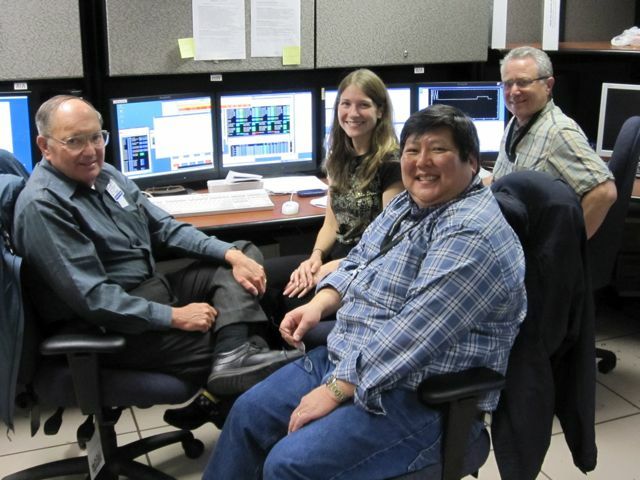 Over the weekend SDO completed the HMI roll maneuvers and began preparing for the image quality jitter tests. The next major activity is to isolate the main engine. First, the isolation pyros on the main engine will be fired to isolate the Helium pressurant and main engine from the observatory. After that is the first 2 Nms delta-H thruster maneuver, used to dissipate momentum. The EVE cruciform maneuver was completed yesterday. Other tests included the high-gain antenna handover with stagger stepping and no-step requests. These tests are required to keep the observatory from moving too much while taking an image with HMI and possibly AIA. Next Tuesday we plan to have an Delta-H thruster burn. These momentum unloads are required to keep the reaction wheels spinning at the correct speeds. Next Wednesday we are having a First Light Press Conference at the Newseum in Washington, DC. Stay tuned for proof that the instruments on SDO are working great! Today SDO ran the EVE Field of View and HMI/AIA Flat Field calibration maneuvers. HMI tested the re-transmission capability of the DDS by asking for re-transmissions of files that were not successfully transferred. SDO has continued instrument calibration for the past few days. These included an EVE cruciform and guide telescope monthly calibration. During the cruciform scan SDO left inertial mode (an attitude-control mode) and went into sun-acquisition mode. This was traced to a wrong number in a filter that slowly pushed the spacecraft in the wrong direction until an automated response cause SDO to enter sun-acq mode. The number was fixed and the GT calibration was run. The EVE cruciform and HMI flat field maneuvers will run Wednesday. This is why we test! I realize I’m growing weary of Haiku. And at the same time, try something new. Like the Bard would have, centuries ago. I have very little to report that you don’t already know. And thus, the uplink is short on demand. I have expressed myself, and await your retort. Eadweard Muybridge is the father of stop action photography. He developed techniques to look at tumbling humans and moving animals. One of his most famous works was to see whether a galloping horse had all four hooves off the ground at the same time. Muybridge set up a series of cameras on the grounds of Stanford University and took 16 photographs that proved the horse gathered all four hooves under its belly at one instant in the gallop stride. 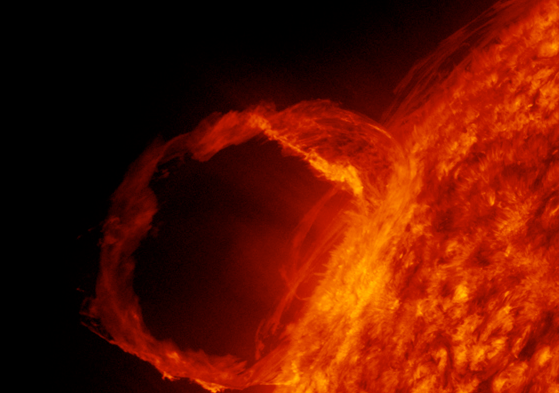 SDO uses similar techniques to make movies of coronal loops, magnetic fields, and prominence eruptions. We also need to ensure we sample the time intervals quickly enough and our pixels are small enough to see what is actually happening on the Sun. Muybridge answered similar questions as he studied animal locomotion. Muybridge’s photographs are on display through July 18, 2010 at the Corcoran Gallery of Art in Washington DC. Our initial Science Reference Boresight was defined Friday. This is the target for the fine-guidance system in science mode, or it is the imaginary line that leaves SDO and hits the center of the Sun. All of the instruments can then figure out where they are pointed with very high accuracy. SDO completed several calibration maneuvers this week, with more coming in next 10 days. Last nite the HMI/AIA roll was done. While SDO spins slowly around the axis pointing toward the Sun the instruments take measurements at different clock angles to check out their optics. We also tried stepping the high-gain antennas separately rather than together to see if the jitter was different. The misbehaving high-powered amplifier on the SDO2 antenna was replaced and SDO2 is being brought back into full service. We have left the vernal equinox eclipse season and look forward to almost 5 months of uninterrupted solar measurements! PI Tom Woods and crew arrived in White Sands Missile Range, NM to integrate the EVE calibration rocket on Monday and perform initial checkouts of the payload to make sure it survived. All is going well, and the launch has been moved up to May 3. Upcoming tasks next week are the environmental tests - vibe, spin balance, and bend test. Hopefully we can get ITAR and security approval for pictures quickly and post those here in the near future. Last evening the EVE cruciform was completed and the high-gain antenna raster resumed. A cruciform scan is a slow scan in a line through the Sun from East to West and another north to South, about 2.5 degrees in each direction. This is used to map out the field of view of the instrument. The high-gain antennas move quite a bit over a year and the raster scans are used to calibrate the pointing of the antennas. Data continues to flow, SDO is GO! Sunday was a day to reflect on all of the data we have collected so far on the interaction of the instruments and the spacecraft. This week we begin a series of instrument calibration maneuvers and more testing of the high-gain antennas. First up is the EVE cruciform maneuver. Today the instruments examined how they affect the pointing of SDO. FIlters and shutters inside the instruments have to rotate into new positions before each exposure, so SDO has a lot things spinning around. Each instrument ran their filters wheels and shutters to see how SDO moved. After that they tested the guide telescopes that are part of AIA. The "Science Reference Boresight" is determined by these guide telescopes, so understanding their behavior is crucial to SDO. SDO spent another day measuring the jitter of the spacecraft, this time how the motion of the two high-gain antennas affected the pointing of the instruments. The instrument teams helped with these tests while continuing to understand their own observing sequences. Today SDO worked to understand how the reaction wheels that provide our fine pointing control interact with the spacecraft. SDO needs to point at the Sun very accurately while taking an image every 0.75 seconds (which means rotating shutters and filters), rotating the high-gain antennas to keep them pointed toward New Mexico, and rotate the entire observatory once per orbit to keep it pointed at the Sun. Understanding how the reaction wheels work is a essential step toward getting ready to send out the "firehose" of data SDO will generate. The doors are open and the CCDs are cold, what's next? For the next several weeks SDO scientists and engineers will work to check out and calibrate the instruments and to coordinate the spacecraft and instruments. I may call it "Focus and Center" but it is a busy time for everyone on SDO making sure these complex instruments do what is needed to get our data. In mid-April we plan to show the world how great the instruments are working at a "First Light Media Telecon." All of the instruments are now working with doors open and cold CCDs. Around 20:00 UT Monday the AIA CCD heaters were turned off allowing the CCD to temperatures drop rapidly from about +40C to -70C and then slowly settle towards their final temperatures. With that drop in temperature, we saw the camera background decrease markedly, and the image quality in all channels improve dramatically. The engineering images are beautiful, even though taken in an approximate focus position. Tomorrow, we plan to make a series of focus scans to determine an initial optimal focus, and work will start on calibrating the detector amplifier gains, instrument stabilization system response, etc., which will continue to improve image quality. SInce opening all nine doors, work has continued getting the instruments ready for normal science operations. HMI continues to work on sequences and the image stabilization system. EVE is working on understanding their data. AIA is looking at solar images superimposed on the thermal background of their still-warm CCDs and updated their on-board flight software. The AIA team members at the MOC celebrate the successful opening of all four AIA telescope doors by 15:30 UTC (11:30 am ET) on Saturday. The doors were opened in the order (by telescope number): 1, 4, 3, and 2. The AIA CCDs are still warm. On Monday the decontamination heaters will be turned off, and the sequencer will be started so the CCD cool-down can be observed. All nine SDO instrument doors are now open.